This Valentine’s Day, skip the busy restaurants and dine in! Valentine’s Day recipes make it easy to replicate those romantic dinner recipes from fancy restaurants. Start your meal with this delicious salad recipe! Pomegranate reminds me of my childhood! My dad used to buy them and peel them for us! Peeling them can be quite messy and none of us offered to help! I did not want to get my hands dirty but I loved eating them! My parents served them without any seasoning but as I am a sweet tooth, I added some sugar or orange flower syrup! Delicious! Did you know that pomegranate has quite the romantic history? In ancient Greek lore, it’s the fruit that Persephone ate that tied her to the underworld for 6 months each year. In Western lore, it is said that a unicorn was tied to a pomegranate tree. The rich romantic history of this fruit makes it perfect for Valentine’s Day recipes! Since Valentine’s Day is fast approaching, I thought that pomegranate would make a nice twist to any easy romantic dinner recipes for this special occasion! This beautiful fruit will add a nice color to any salad recipe as well as crunch! You can still eat them bare too! 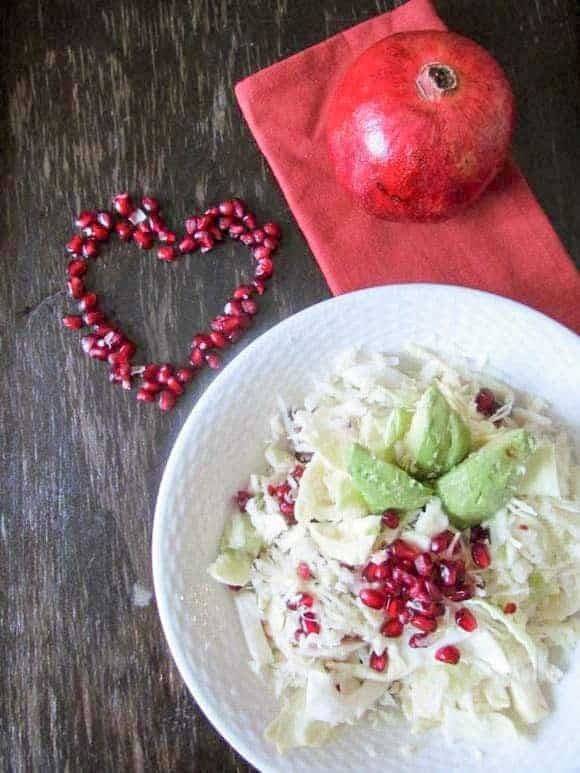 Valentine’s Day recipes: Pomegranate, Avocado and Cabbage salad! I know that last week, when I shared the cream of broccoli cheese soup recipe, I mentioned I did not like salads during winter, which is true! But I still prepare some salad recipes and serve them as a filling to my crepes or sandwiches! On warmer days, I can serve them as a quick appetizer! Besides, winter days can be depressing so adding a nice colorful ingredient such as pomegranate in your easy recipes can improve your mood! Pour the seasoning and serve! This easy salad recipe would be a perfect appetizer for your valentine’s day meal: quick, easy, crunchy and most of all: Red! 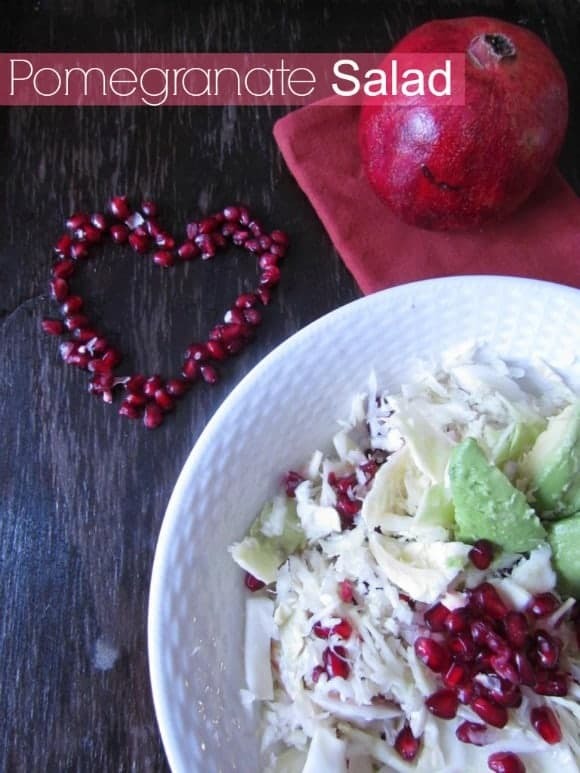 Have you ever tried pomegranate in your Valentine’s Day recipes? Share with us your easy healthy recipes! Happy Valentine’s Day! I have never thought to put pomegranate in a salad. This would make such a fresh and colorful addition to a summer meal. I love that there is not a lot of prep. Can’t wait to try it. Just wanted you to know that your recipe is being featured on foodie friday today. I will be pinning and tweeting it though out the week. The colors and the flavors are just wonderful in this salad. Thanks for bringing it to foodie friday. This salad is so unique but now that I’ve put the ingredients together in my mind, I can just imagine how tasty it would be! Thanks for the recipe! I’ve never thought of this combo. I have to try it! Thank you for linking to the Weekend re-Treat Link Party. What a great Salad, I just love the addition of the pomegranate’s. This will be a great salad for Valentine’s Day. Thank you so much for sharing with Full Plate Thursday and have a great weekend! This salad looks delicious! I never used to like cabbage, but have grown to really like it in salads. Thanks for sharing. Yum. I am pinning on my healthy recipe board. Love the photos too! That sounds delicious. I am always looking for fresh and interesting salads to serve. This sounds great, and looks yummy! I would have never put the two flavors together, but I have to try this. My son loves pomegranates, I will try this for him! So Pretty & Sounds Delicious, Thanks For Sharing! Looks delicious! Love the red for valentines day! Very cute! Even though I am not a big cabbage fan I would love to try this salad!! 🙂 Looks quite tasty. What a pretty salad! Thank you so much for sharing at Simple Supper Tuesday. It tastes crunchy and a bit sour! I like it but i have never seen it peeled! This looks yummy, I still haven’t tried Pomogrante. I am interested in what it tastes like but I never can find the fruit already peeled. This looks beautiful!! And I bet it’s SO delicious! I can’t wait to try this out. I’ve been looking for new salad ideas 🙂 And so cute for Valentine’s!! Thanks Brandi! It is really delicious!